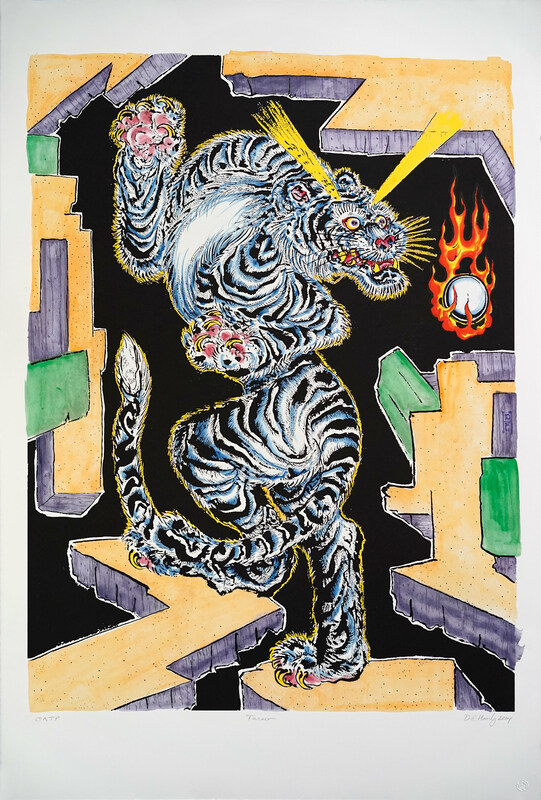 Don Ed Hardy's new editions Cosmo and Turner practically crackle and spill off the page with energy and movement. In both prints Hardy finds a harmonious balance between the deep blacks of a woodcut relief print and airy, painterly washes of acrylic color. "The dragon and the tiger are traditionally the natural primary symbols of Heaven and Earth, yin and yang," Hardy says. The artist has a lifelong interest in such imagery: as a pre-teen in the early 1950s, he would savor souvenir artworks sent back by his father from Japan. In the early 1960s, Hardy's studies of Taoist and Buddhist texts became the cornerstone of a wide-ranging artistic practice that has since brought him international renown in the worlds of tattooing and fine art. Turner, named for one of Hardy's heroes, the painter J.M.W. Turner, "is based on a thumbnail sketch I did of an ancient sculptural detail in India four years ago," he explained by email earlier this year. "I had never used a contrapposto pose in any of the hundreds of tigers I’ve done over the years in various mediums. The flaming pearl represents wisdom and truth in Buddhist tradition." The dragon, Cosmo, is named "for a very exuberant puppy who we got recently; as I was completing the piece, I realized the image exuded the manic energy and excitement of the dog." 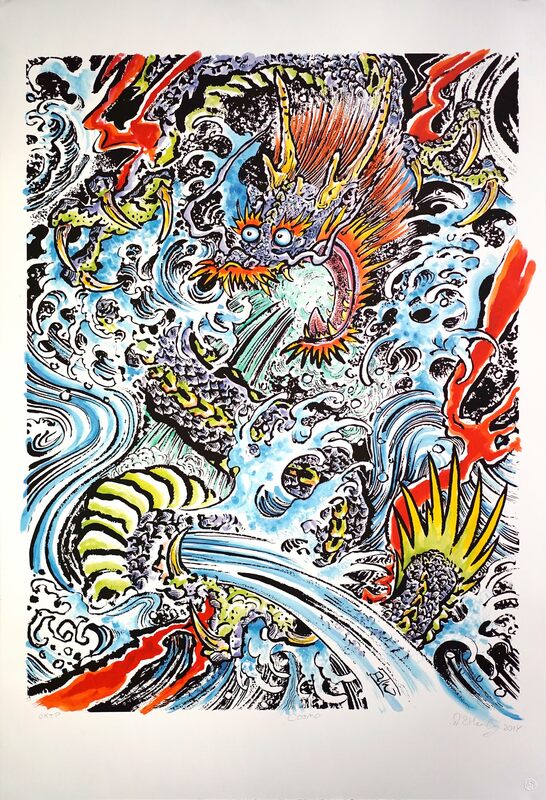 While the dragon is painted in a more traditionally Japanese style, he writes, "the rocks surrounding the tiger are based on Korean folk art paintings and serve to balance the circular vortex energy in the waves around the dragon. Likewise, I wanted a different, 'calmer' color scheme around the tiger: flatter, quieter." Hardy painted the designs for Cosmo and Turner using black sumi ink; his paintings were transferred to a wood block matrix by a combination of laser and hand cutting and printed in black relief ink on an etching press. Hardy's hand-painted acrylic washes were then scanned, registered, and printed in UV-cured acrylic ink under the artist's supervision. Cosmo and Turner were printed by Nicholas Price and Tallulah Terryll at Magnolia Editions in Oakland, California in an edition of 33. While their symbolism runs deep, the immediate, appealing energy of these prints is more physical than cerebral: their intensity is easily felt, regardless of one's knowledge of Eastern traditions. Hardy's compositions seek the essence of heaven and earth, and as Shakespeare says in Hamlet, "There are more things in heaven and earth, Horatio, than are dreamt of in our philosophy."